“Traveling Journals” that are passed back and forth between two or more people are all the rage, particularly between an adult and the special child in their life. Creating a journal for just the two of you is a great “stand alone” project to help you stay close and connected. It’s also the perfect way to build the foundation for what is to come in this series and to create excitement about the activities you are about to share with them. A journal is a place where you can capture those special moments by way of messages the two of you write to one another describing what you enjoyed most during your special “date”, or what you learned about each other. You could also add photos of your time together and decorate the pages together. 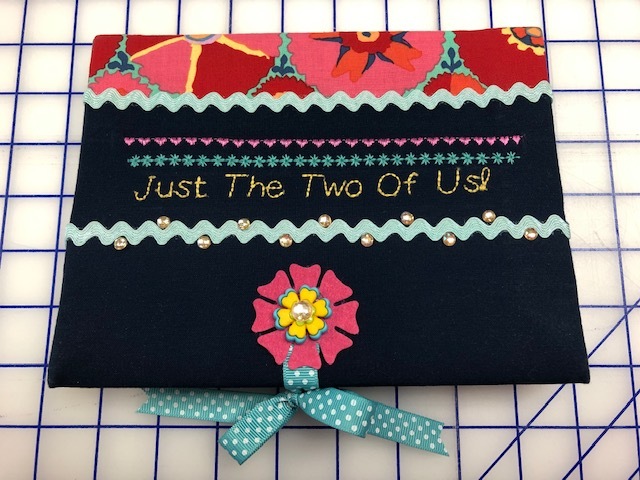 In this class, you will create a one-of-a-kind journal cover that is unique and special to the two of you. You will also be given ideas of how the two of you may want to use your journal, including discussion questions and ideas of what the two of you can do outside the class to continue your journey together, together with sample journal prompts or topics the two of you may want to discuss. Engaging the child in creating the journal together gives the child the opportunity to be part of the decision making process right from the outset, and will make the activity that much more special to them. As children grow, their lives get busier and the time you have to sit and talk or just be with them gets less and less available with each passing year. Before you know it, they’re in high school or off to college! Making arrangements for quality time and a special activity to share, just the two of you, helps you to stay close and connected to that special child in your life, and can strengthen and deepen the relationship between the two of you. This is an opportunity for parents, grandparents, family members or friends to do just that, without the hassle of wracking your brain trying to come up with something to do. We’ve done all the planning for you by way of an ongoing series of classes (Listed below), featuring a variety of sewing and craft activities that are both fun and engaging, together with ideas for similarly themed activities the two of you may enjoy outside of class. Each class is centered around a special theme, with a “catchy title” intended to pique the child’s interest, keep them guessing and get them excited to see what the special activity is that you have planned for them (Making it a guessing game between classes can add to the fun!). For those adults who love to sew, this is a wonderful opportunity to share your passion and pass it on to a new generation. But, prior sewing experience is not required, and activities will not be limited to those that involve sewing. We hope you’ll join us - along the way you may find that you’ve both learned new things about each other. And, when it’s over, what an amazing memory for the two of you to look back on! Title: Who’s the Sweetest Cat of All? Requirements: Very basic machine sewing skills are all that is necessary to complete the project and will be taught during class to those who are new to sewing. Classes are open to girls and boys, ages 6 -12 accompanied by an adult over the age of 18. Class Fee is for 2 attendees making one project.